I just spent a week in San Diego. It’s true, what they say — San Diego has perfect weather and the scenery is breath-taking. In the middle of our vacation week, I learned that a dear man from our church fellowship had unexpectedly passed away. I had joined others in praying for his recovery from surgery earlier in the week. It wasn’t meant to be. Again, for perhaps the fourth time in recent weeks, I was reminded that so much of life is about perspective. I felt blessed to be on an adventure with my sister and eagerly agreed to visiting every site, restaurant and experience she suggested. The primary reason for our trip was to check out her daughter’s outdoor wedding venue so that I could make suggestions for flowers. (Okay, I also just wanted to leave Indiana’s torrential rains to bask in the sunshine.) That pleasant task came on the heels of learning our friend had passed away. It didn’t taint the joy of anticipating my niece’s wedding, but it did lend poignancy to her plans to begin a new life with her beloved. Our friend and his wife had 18 good years together. They weren’t years they had been promised. They were a gift, an expectation fulfilled. The young couple planning their upcoming wedding holds the same expectation. It strikes me that as my niece looks to the future, a widow is forced to reflect on the past. Both behold their beloved with eyes that see — the promise of a future, the gift of memories. 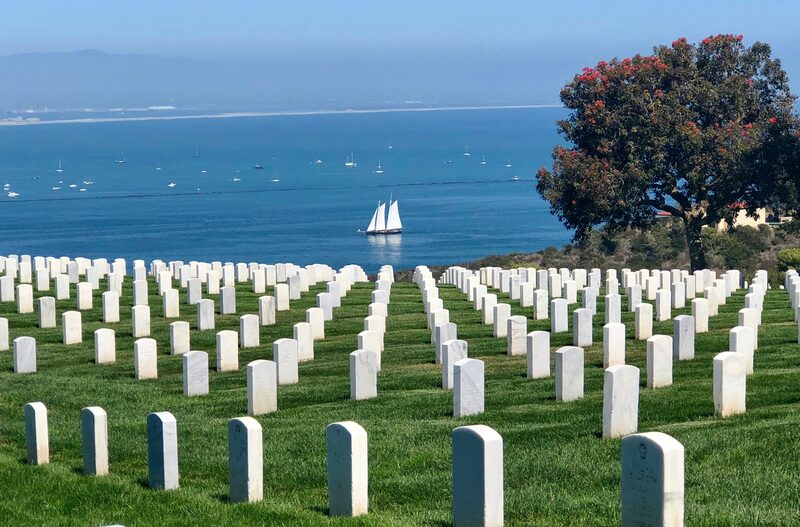 The image above (taken by my sister) is a portion of Fort Rosecrans National Cemetery, located on a peninsula that juts into the Pacific Ocean. The cemetery spreads out on both sides of Cabrillo Memorial Drive. My niece’s fiance has ancestors buried in the cemetery, which is now closed to new interments. At the tip of the peninsula are the Old Point Loma Lighthouse and a monument to Juan Rodriguez Cabrillo, the first European to set foot on the west coast of the United States. The view from the lighthouse and monument is stunning. To the east is Coronado Island, site of a U.S. Naval base; to the west is the broad expanse of the Pacific Ocean. As I reflect on the events of last week, the views speak to me of two realities and two opposing yet complementary perspectives — a beautiful resting place positioned above a national hub of protection, surrounded by the ocean’s seemingly endless expanse of infinite potential. A life drawn to a close and the promise of life to come. If you follow me on social media, you may have caught wind of the fact that I’m returning to school! I’m enrolled as a student in the Certificate of Ministry to Women program at Moody Bible Institute. It’s a two-year, on-line program which will include a couple of weekend workshops on campus. The course begins later this summer. You can expect future posts to reflect some of the content in the classwork required — just giving you fair warning! I’m excited to have you join me in this adventure. This is poetry, Ingrid! Lovely writing! Thank you, Shanda. Your “perspective” on poetic prose is greatly valued! 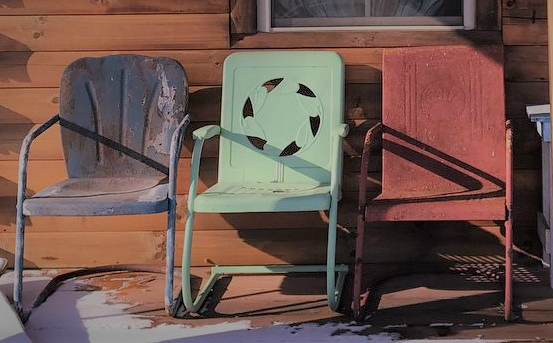 Grab a chair on the porch and receive updates! Slice of Life Notes is my monthly newsletter, and Slice of Life Letter is my quarterly update with a few extras written just for you. Yours, mine, ours. 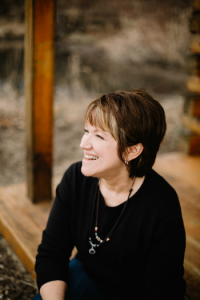 When God wrote the book of this world, He knew it would not be complete without our stories. Welcome to the space where I offer my “slice of life” stories, and where I invite you to share a few of yours.